We have had crazy weather all winter. Over the last few days it has gotten so hot we had on shorts while we were out in the yard playing. Then in a few days we will back to wearing sweaters. The kids and I took advantage of the nice weather to makes a colorful wind chime craft. We crafted outside, enjoyed the great weather, and created pretty wind chimes to hang up in the yard. Win, win, win! 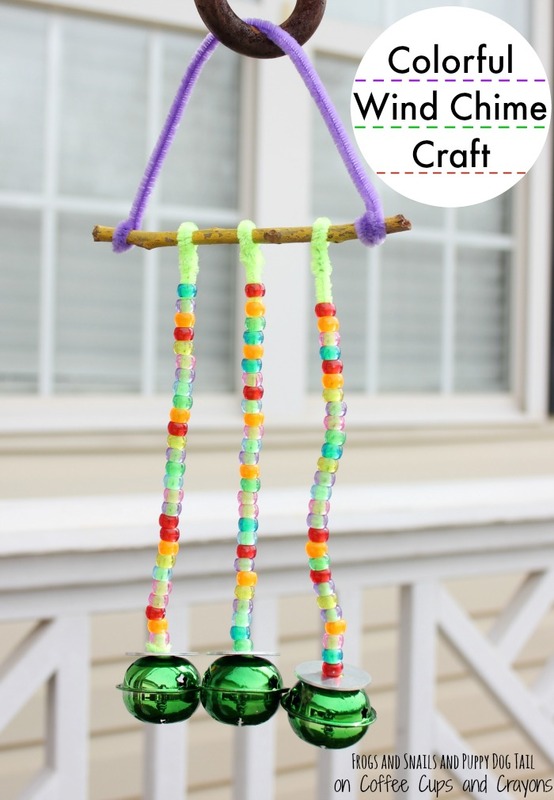 This colorful wind chime craft is so much fun because you can substitute different craft supplies if you want. We used what craft supplies we had in the closet, but really anything similar would work. 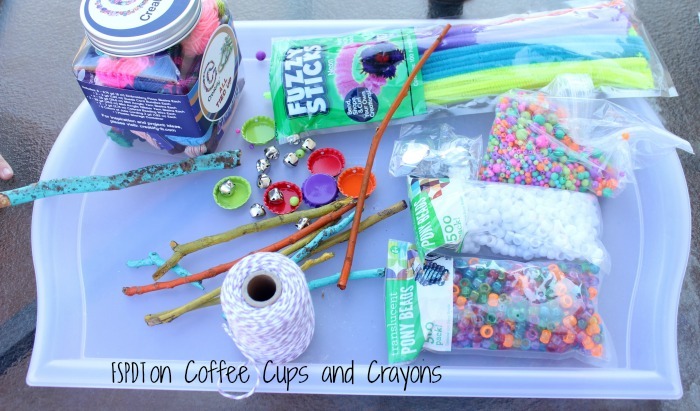 This kids craft is fun for a family project but could be great for a play-date or classroom craft too. Spring will be here before we know it and hopefully we can all get some great weather to enjoy and colorful wind chimes outside! jingle bells, washers, bottle tops, etc. Whatever else you might have on hand that would work–be creative! If you choose to paint your sticks that is the first thing to do. Once they are dry you will continue the craft. If you do not paint them then you are ready for step 2. Take a pipe cleaner and wrap it around the stick on either end. This gives you a way to hang up your wind chime later. 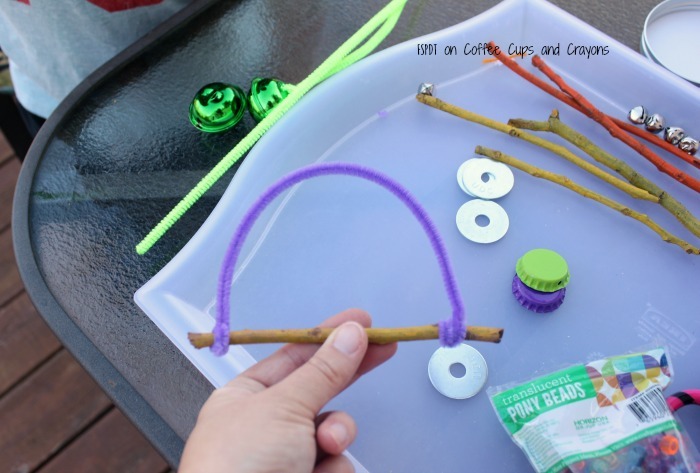 Let the kids pick out craft supplies for their wind chime: beads, jingle bells, bottle caps, etc. Get the kids involved and let them be creative and pick out what they want to put on them. 4. Take a pipe cleaner and thread it through the jingle bell and wrap the pipe cleaner around itself to “tie” on the bell. 5. Now the kids can add the beads. 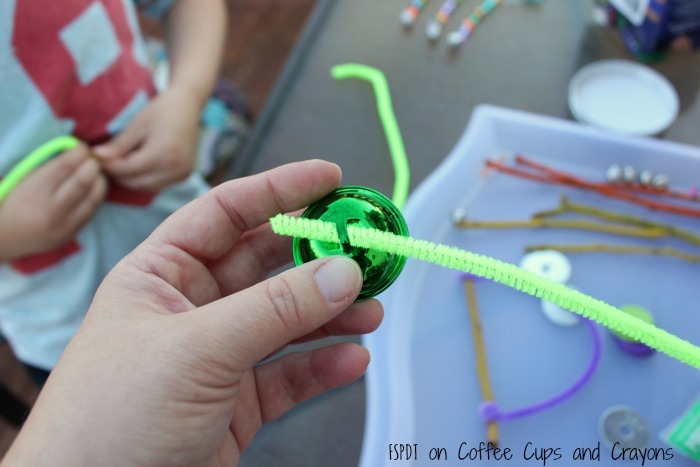 Have the kids leave room on the pipe cleaner for you to use to wrap around the stick. 6. The washers were a last minute idea so we added those on over the beads and they sat on top of the jingle bell. Ideally you would do this before adding the beads. 7. Last wrap the decorated pipe cleaner around the stick. We did 3 pipe cleaners on this wind chime. Now we had a colorful wind chime to hang up. Since I have more than one child we made a few more. 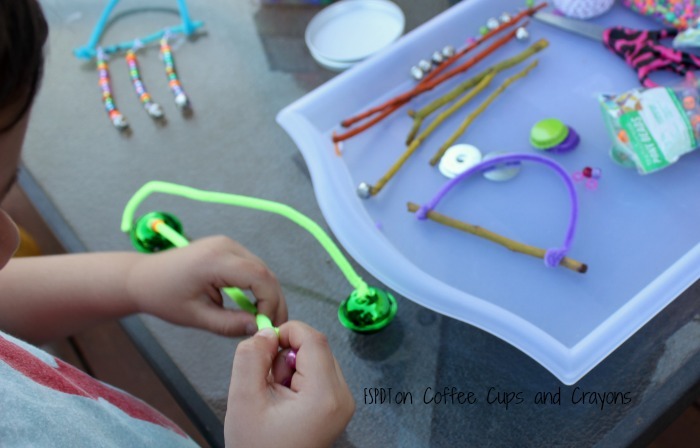 The process was pretty much the same as they just added different craft supplies or used string instead of pipe cleaners. You can see all 3 wind chimes we made in the last photo. These few days of warm weather have me ready to say hello to spring and goodbye to winter. 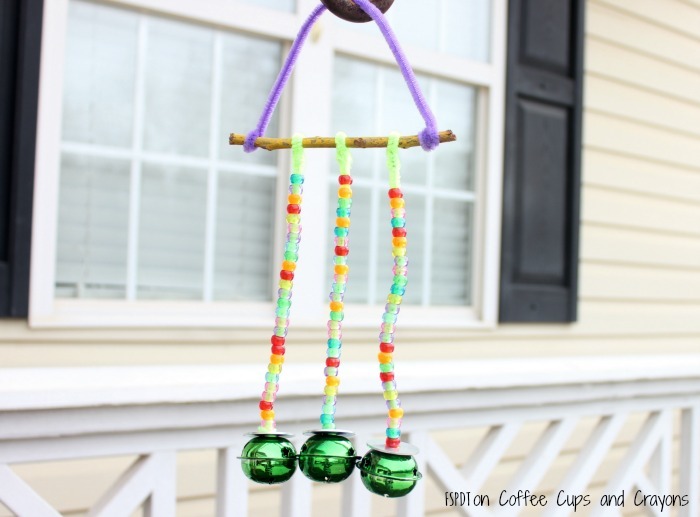 But no matter the season the kids and I will be able to enjoy our colorful wind chimes! This was a fun and easy craft to do with my 3 kids. 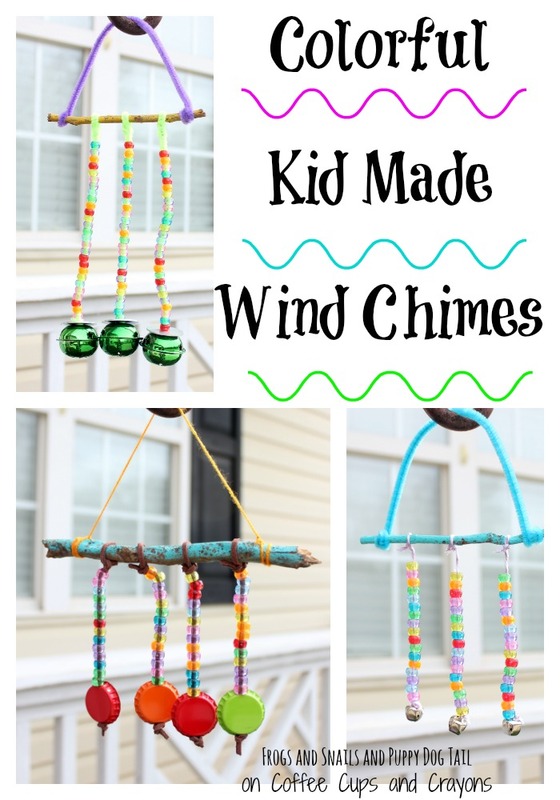 All of them had fun with this DIY wind chime project. I have a feeling they will be asking to make more of these real soon. Great ideas. Thank you for sharing. You are creating wonderful memories for your boys. Mine kids are married men now and I am doing crafts with my toddler age grandkids. Love the various windchimes. Oh how sweet! I bet they love crafting with you!!! !